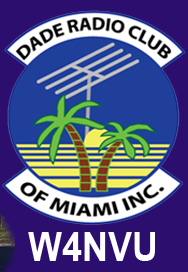 May 2013 Meeting Minutes – W4NVU – Dade Radio Club of Miami Inc.
Meeting was called to order at 19:30 with 28 present. We have a quorum. Miguel announced that we were having a raffle tonight of a laser kit. One ticket for $1.00 and 3 tickets for $2.00. Corresponding Secretary – Not present. Website –Newsletter – Ryan is in testing. Armando advised that they just finished a class last Saturday and we have 3 new Hams. Another class will start in July for 3 Tuesdays starting at 8:30 AM – 12 Noon at the EOC. Andy will be an instructor. Club Elmer/PIO – Frank nothing to report. Julio is on his way to Dayton, Ohio to their Hamfest to hand out flyers for our Hamfest. Miguel spoke about D-Star. He spoke with Frank. Carl advised that he has an antenna for the UHF. They will get it moving. 147.000 – Merritt not here tonight, but Miguel advised that he is working on it. 444.200 – Carl advised that it has a linking system problem and he is working on it. Miguel advised of the weekly nets on Wednesday night from 7:00 PM – 7:30 PM. 146.925/146.520; Coral Gables Net – 147.150; UHF 444.200; The totals of all nets are checked-in from 7:45 PM – 8:00 PM with Shannon the net control. 144.210 side band on 2 meters from 7:00 PM – 7:30 PM on Wednesday nights too. Steve Taylor – the president of the Everglades Radio Club spoke about Field Day. It will be June 22/23, 2013 at the SouthDadeAgriculturalCenter at 288 Street and SW 187 Avenue. We can set-up 8 hours earlier so they will start at 4PM on Friday night. Our club will be joining them this year. Saturday, June 22 will start at 12:00 Noon. They need operators. Bring your equipment. They will have satellite radio for extra points; national traffic system for extra points; CW operators, etc. There will be plenty of room to spread out. Miguel stated that the Hamfest will take place next year on January 31 – February 1, 2014. The venue has been secured. The next meeting is next Monday nights at 7 PM at the EOC. They need volunteers. Miguel announced that we have Polo shirts and Hamfest shirts on sale. We have flyers for the Hamfest. Please take some and start handing them out. Miguel announced that the Junior Orange Bowl Parade will be on the Thanksgiving weekend this year. More info TBA. David announced that the Kayak race will take place the end of September. Rene won the raffle of the laser kit. Congratulations! The DRC meeting was adjourned at 20:05.